Accept greetings from CBIW. We are doing great in all that we have planned to do for this third quarter. I do hope your family and the church are doing great. I am always very happy to share with you what is making news in our campus. God is doing great things to accomplish His work in our lives. In the picture to the right, preacher Eddie Samuel performs the baptism of this new sister. Please keep her in your prayers so she will continue in the faith. All students are doing fine after a short break. They went to their villages and some went to where they served during campaign and God used them again. All the programs for this week went on well, from morning devotions to evening devotions. The theme for chapel for this month is MAKING YOUR CALLING SURE. Students and lecturerers are encouraging one another in our calling and to perfect it in any giving opportunity. Our student, Etongwe Nicholas, worked in a village where the church existed in the 70’s but was dead. He succeeded in seeking these Christians and one new Christian was added into their body during the student’s stay in Nyassoso. Please commit this young congregation in the hands of God as they are pleading for the school to be sending students to nurture and evangelize their community which is characterized by Presbyterianism. 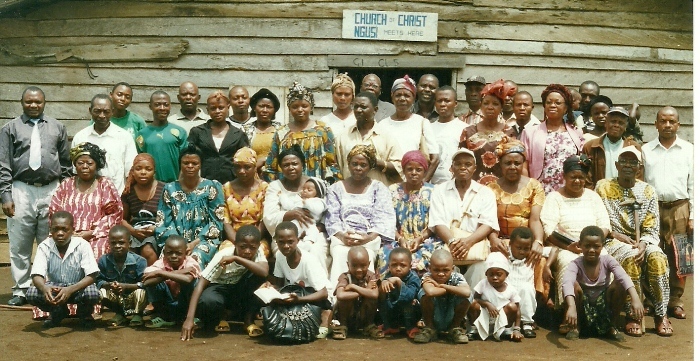 Etongwe Nicholas worked in the Ngusi congregation with the family there. This is a congregation that had problems that led to severe division and backsliding. When our students arrived at the village, he did his best to win back many who were fallen and they came back rejoicing, serving their God. Please from about 10 members who remain to this number now, the number of Christians that returned to the faith during his stay there. More will come as long as we continue to send students to this congregation. Remember this work in your prayers and support us to go where the gospel is calling. 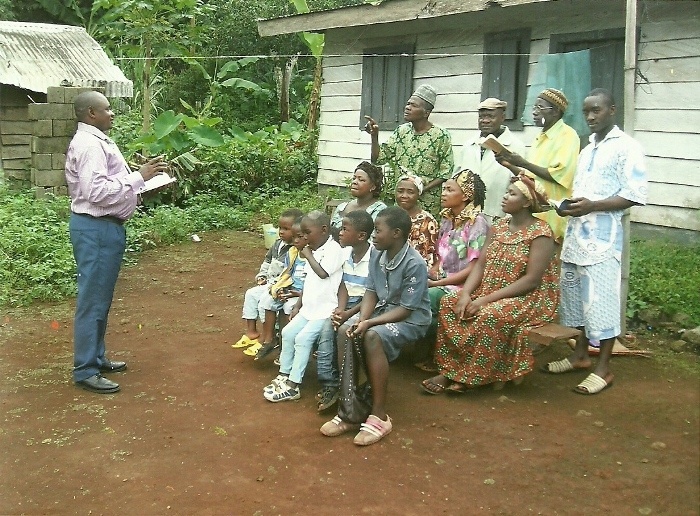 The Negusi congregation had a great day during worship. Some of them who have stayed above 10 years without worshipping. We glorify God’s name for the creation of CBIW. Many thanks to the Bear Valley Bible Institute for coming to us and many of you who stand by us to see the realization of our dream. Many more things will be done as long as this school remains in this land for the glorification of God through His works. The CBIW students endured heavy rains on their way to baptize Linda Pempeh, our new sister who accepted Jesus as her Lord and Savior being baptized into Christ. Her father is a pastor in the United Pentecostal Church. Since her baptism we have not had any problems from her family members, glory be to God. Because most of the time, people from such backgrounds will bring problems to the preacher and the church and at times, it will end up to be a police case. I just returned from a mission trip making arrangements for our next campaign. Thanks for your prayers through my travel. We shall, by next month, involve in the virgin lands, a campaign to establish congregations in communities where there is no church of Christ. I pray God will open the way for us to have means to meet up with this campaign. We have a projection device and DVD from WVBS that we can play to attract the community to come and watch and at the end we shall preach the saving message, but we are still in need for a public address system so that we shall use it to preach and people will hear us from a distance. We are also in need of a generator so that when we go to villages without power, as most villages are without power, it shall not hinder the gospel to go forth. Think about this and help us, as we prepare the living bread for those who are hungry. We shall give it freely, but come and be with us in the bakery to produce this bread. Transportation to mission areas and back to the campus is another problem we are crying about. Thanks very much for being there for us. Thanks for your prayers, support and concern. Do your best to share this news with others. God bless you. Posted on July 17, 2011 by Bob Turner and tagged Cameroon.